Camera calibration consists of determining essential parameters of the optics and of the sensor. Once a precise calibration is achieved, modules such as DemoARtoolkit can recover the exact location and orientation of a marker in 3D space. JeVois includes a set of default calibration files for the standard sensor and optics. Note that calibration is dependent on image resolution. So the procedure described here should be repeated for every video resolution which you intend to use. Start with a fresh Ubuntu 16.04 virtualbox. Follow the instructions at http://jevois.org/doc/Virtualbox.html but with Ubuntu 16.04. Beware: you may have problems compiling ARtoolkit with later versions of Ubuntu. Make sure you reboot your host and install the USB device filter. You should get to the point where you can see video in guvcview when you connect your JeVois camera. We will compile ARtoolkit5 natively in our virtual machine. The camera calibration will just select the default video mode from the camera. Save to JeVois (CTRL-S) and confirm that you can see video after JeVois restarts. Do this on another machine running JeVois Inventor (or quit your virtualbox first and run JeVois Inventor). Make sure you print it at 100% scale. As instructed in the ARtoolkit calibration docs, tape the pattern down to a flat surface and confirm that each square is exactly 30mm x 30mm. Capturing Calibration Images Calibration requires the capturing of a series of images. In the top-left corner of the capture window is displayed the number of images captured so far. 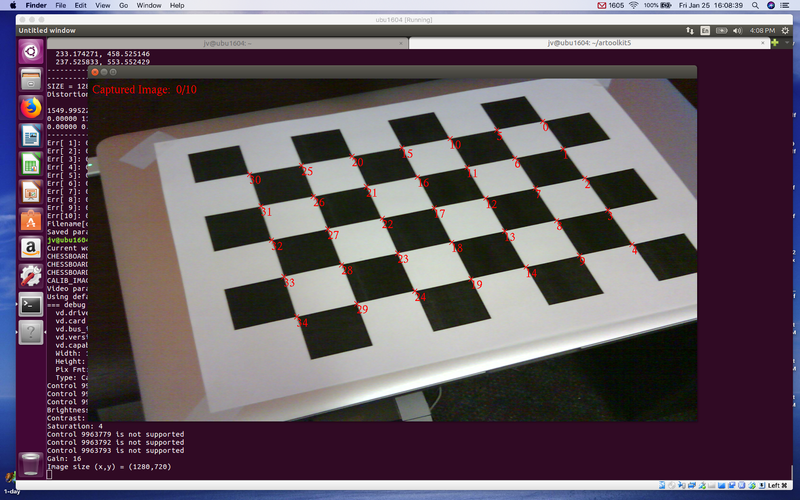 Point the camera at the chessboard grid, and the inner corners of the squares will be highlighted with 'X' marks and numbered. When the camera can clearly see all the intermediate corners, the 'X' marks turn RED, and a calibration image can be captured: A good view of the calibration board, ready to capture. If some of the corners are obscured by the edges of the camera frame, or poor lighting or reflection, the 'X' will be GREEN, and no calibration image can be captured until the optical conditions are changed. A poor view of the calibration board, NOT ready to capture. Once you have an image with all red 'X's, you can press the keyboard spacebar. The spacebar tab captures the video frame augmented with red 'X' characters. The relative positions of the 'X' indicators on the captured frame are calculated, recorded, written to standard out of the command-line window and the capture counter is incremented. To obtain a good calibration for the camera, it is important to obtain images of the calibration board at a variety of angles to the camera lens. Note that this involve holding the calibration board at different angles relative to the camera, including upside-down. Once all the calibration images have been captured, that is, ten (ten is the default) presses of the spacebar, the calibration data is tabulated and a distortion factor associated to the camera device is calculated. The tabulated calibration data is written to standard out of the command-line window. At this point, the application prompts for a filename to write the calibration data to. Copy the calibration file to JEVOIS:/share/camera/ on your camera, naming it exactly: camera_para1280x720.dat for 1280x720 resolution, or change the name for different resolutions. Next time you run DemoARtoolkit with that resolution, it will load the calibration file.